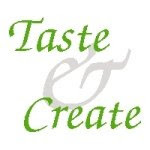 This month, Taste & Create had dwindling numbers for some reason, and an odd number at that. We can't have an odd number, so I put my name in the hat twice. PJ from Seduce Your Tastebuds is one of my partners this month! We've been paired up before (I think most of us have been paired up before), and I always find something interesting of hers to prepare. This time I found her Vegetable Pulao recipe, actually her mother's recipe, and she said it's a favorite of hers so I just had to try it. Although I do have some channa (dried chickpeas) in my pantry, I completely forgot to get them soaking the night before. I thought I had canned chickpeas (garbanzo beans) to use, but I didn't. I tossed in some cannelini (white kidney beans) which were the closest I could get! I actually ended up taking several liberties with this recipe. Luckily, it turned out good! I didn't have basmati rice, and I had to improvise grinding things to a paste. I used my Black & Decker One-Touch Electric Chopper to process everything that needed to become "paste" and it worked quite well. I will double the spice mixture next time, as it turned out surprisingly on the bland side for an Indian dish, a good flavor, just not strong enough! Another issue I had was that I don't own a pressure cooker. Luckily since I didn't have basmati rice anyway, it wasn't an issue. The only rice I found in my pantry was some brown Minute Rice, so I used that. My substitutions and methods are listed below. Please follow the link to PJ"s website for her original recipe. I'm just happy that mine turned out at all!! This is a satisfying dish, especially yummy with the tangy raita on top! Prepare the ground paste as noted above, set aside. Heat a little ghee in a saute' pan and saute' the vegetables on medium heat for about 5 minutes. Remove and set aside. Heat the remaining ghee, add the rice and saute for a couple of minutes. Then add the ground paste and saute for 2 minutes. Add the vegetables, salt, channa and 4 cups water and bring to boil. Boil for about 10 minutes, or until water has evaporated, rice and vegetables are tender. Serve with a raita of your choice. Grind the coconut and ginger to a fine paste with a little water. Mix the yogurt with salt, stir in chutney (coconut mixture) Pour into serving bowl, sprinkle with cumin powder and serve garnished with coriander leaves.